GoSaveNow, or GoSave, is a browser add-on for online shoppers because this program displays special offers and coupons. However, in addition to shopping-related information, GoSaveNow displays some irrelevant pop-ups that have nothing to do with the user’s interests or the content of the website. GoSaveNow may seem to be a highly useful program, and it is advertised on a very sophisticated website, which is gosavenow.info. It is important to note that the official website does not prove that the program is reliable. GoSaveNow is included on the detection list of some malware and spyware removal programs, and it is high time you installed one if you want to get rid of GoSaveNow pop-ups and other advertisements. For example, after installing GoSaveNow, you are likely to receive some deceptive advertisements. You may be invited to update your Flash player, take part in a survey, etc. If you do not want to install malware, ignore GoSaveNow advertisements and remove the program. Below you will find our step-by-step instructions on how to uninstall GoSaveNow and remove its browser add-ons from Google Chrome and Mozilla Firefox. Note that when you uninstall GoSaveNow, Internet Explorer is cleaned automatically. Moreover, you should pay close attention to the removal process and read through the dialog box. You have to click the No button; otherwise, some new adware programs, such as NextCoup, will be installed. Our advice is to implement SpyHunter because this real-time security program removes GoSaveNow from the computer with ease and fights off multiple malicious threats, including Trojan horses, browser hijackers, ransomware threats, adware programs, rootkits, etc. Move the mouse pointer to the lower-left corner of the desktop. 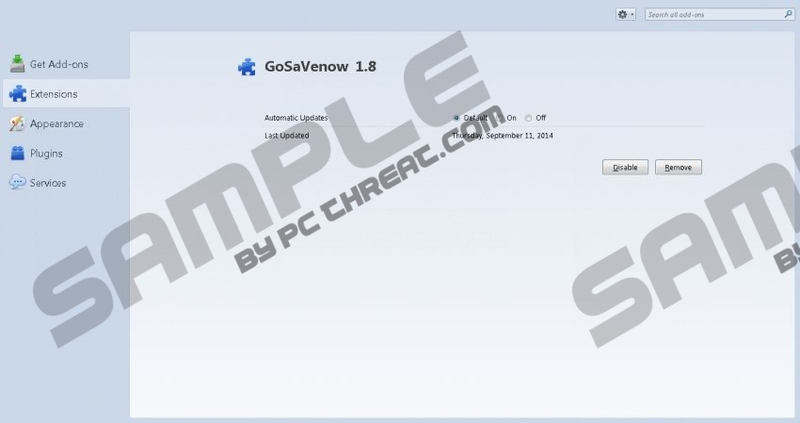 Having removed GoSaveNow from the computer, do not hesitate to scan the computer so that you can be sure that the computer is adware-free. To do so, click the download button and install our recommend program. Quick & tested solution for GoSaveNow removal.